Poco is an eleven year old Pinto gelding. He stands at 15hh tall and is brown and white with two blue eyes. 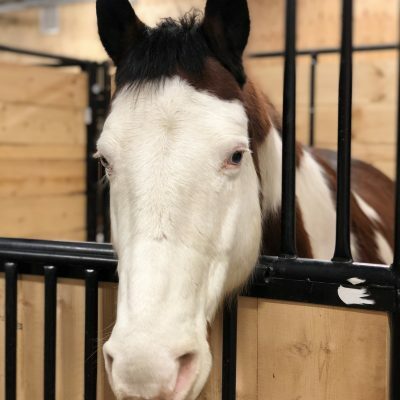 Poco joined the PARDS program in September of 2018 and is leased to us from Sharifa Leigh. Poco has a wide build and a very rolling walk which can help open up his riders diaphragm which is important for our riders working on speech. Poco is great in lead line therapeutic lessons and does very well with an experienced beginner rider for public/independent riding.